Kate and Oli: Focus On... The Harbinger Co And A Giveaway! I am always amazed by people who have talents I don't. I love the moment when you think, "How does she do that?" And that is exactly what I thought when I first saw the work of Yvonne, of The Harbinger Co. She creates the most intricate, interesting, eco-friendly jewelry I've ever seen. Yvonne graciously answerd my questions and (even more graciously) offered to giveaway a beautiful necklace to one lucky reader! I consider myself an aspiring artist. Art has always been a constant in my life, and what I was best at. I got a little distracted during my college and grad school years, where I was an economics major at Stanford and thought I wanted to go into finance. Then I went to grad school for urban planning because I thought it would be a good compromise between economics and design. But I realized soon after that I needed more creativity. 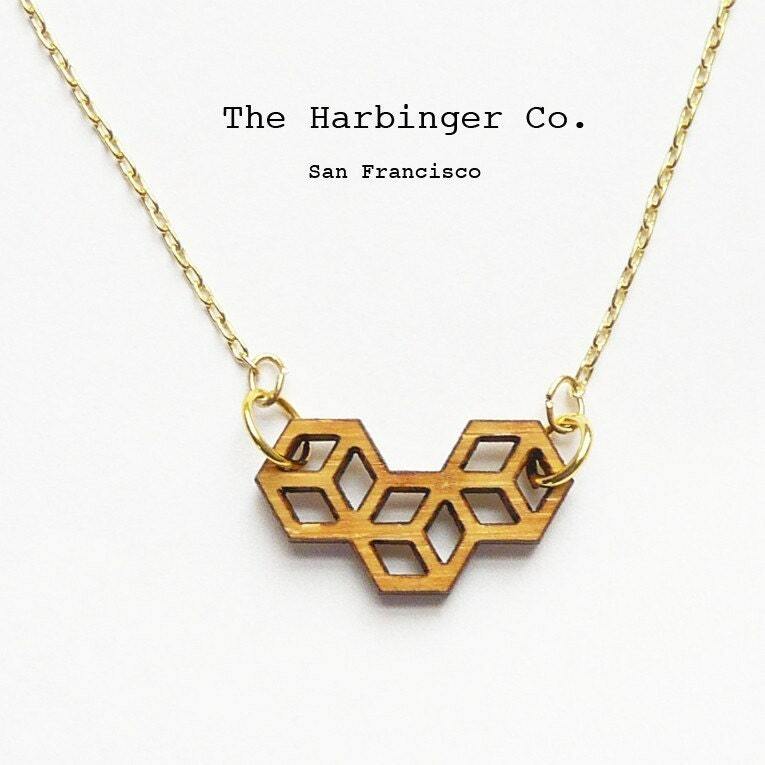 After a few years working as an urban planner/designer, I started selling lasercut jewelry as a side gig under The Harbinger Company. Recently I quit my job and am taking a 1 year sabbatical to do all the projects I never had a chance to. So in addition to my lasercut bamboo jewelry and wood boxes, I'm going to make metal rings, leather and cork handbags, paintings, and maybe furniture. I just want to let loose and do everything. Acrylic, water color, pencil, pen & ink for drawings because those are clean enough to use at home. Bamboo, non-endangered woods for jewelry and home decor. Heavy duty raw canvas for painting and sewing. I love canvas because I'm a painter and it's so durable. Leather and cork fabric for my new handbags because they are nice to touch and biodegradable and not harmful to the environment. Papers of all sorts for collages and mixed-media works. Etsy is a great venue for artists. I like how the interface is really simple, and you can set up shop without having to know how to make a website. The Etsy community is also large and growing, and that helps with marketing and getting your name out to the public through the daily features, blogs, etc. I love patterns of all sorts, so most of my jewelry and boxes so far are inspired by patterns in nature, architecture, geometry, etc. I also love maps of all sorts, even before I was an urban planner. I am also inspired by artists and designers such as Mel Kadel, Shepard Fairey, David Ellis, Ryan McGinness, Jason Munn, BLU, Ghada Amer, and so many more. I also love ethnic patterns and textiles. Mostly indie pop and dixieland jazz. When it's cold outside... Which it is always in San Francisco, I stay home and draw, design, or make things. When I'm hungry... I eat. When I need a boost... I go for a walk or to the gym. I wish I was/were... A successful designer and artist who was an expert on everything: web design, animation, architecture, welding, wood working, sewing, industrial design, fabrication, film. A more realistic goal would be an environments designer. If I could give one gift to everyone I know, it would be... Either a plant or a cd of my favorite songs-affordable and likable. Or if I'm Oprah, a well designed housing unit. If I could have coffee with anyone, it would be...French Artist JR who does the large scale artwork in urban slums throughout the world. Besides art and design, I am interested in international development, and JR has bridged two fields. If you were an animal, what would you be? A bird. What's your favorite piece of your own? My studs. And my leather cork bag which is not for sale yet. What are your favorite blogs/websites right now? Kate and Oli of course! And notcot, design-milk, svpply, notcouture, apartment therapy, fecalface. Yvonne has fabulously offered up a 20% discount code just for Kate and Oli readers. Simply enter the code KATEOLI (case-sensitive) when purchasing anything from her website (not her etsy) and receive 20% off your total purchase! 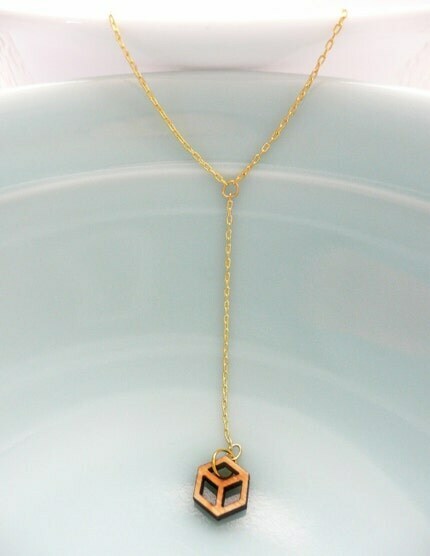 Yvonne has also offered one of her fabulous triple cube necklaces to a lucky winner! I have one of these amazing pieces and you will get tons of compliments! Plus, it goes with everything and is as light as a feather! Head over to The Harbinger Co. and tell me your favorite item! - Become a Facebook fan of The Harbinger Co.
Fine print: Giveaway begins when it is posted and ends at 11:59pm pacific standard time June 3, 2010. A winner will be selected by a random number generator on June 4, 2010 and will be emailed promptly. The Harbinger Co will ship anywhere in the world! I really loved the "Bamboo Gem Drop Earrings"
I became a fan of The Harbinger Co on facebook! I'm a fan of Kate and Oli on facebook also! 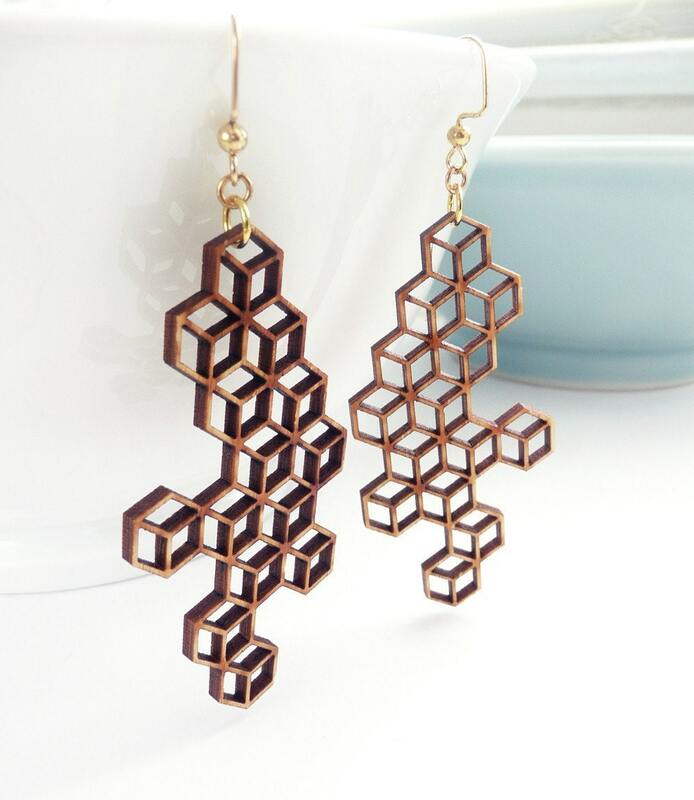 I love the bamboo honeycomb earrings, because I am a sucker for big earrings. My favorite is the Bamboo Honeycomb Lace Necklace. 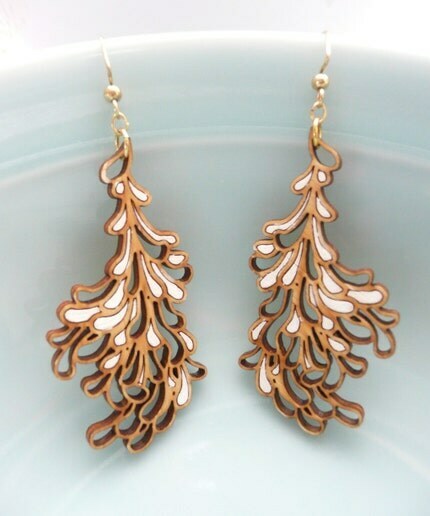 The blossom bamboo earrings are beautiful, and just the right size!! on the Harbinger Co. mailing list! 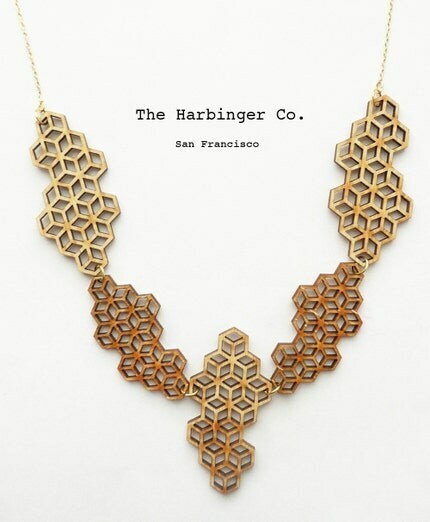 I love the "Medium Bamboo Honeycomb Pendant Necklace"! I became a Facebook fan of The Harbinger Co. I am a kate and oli fb fan! I love the Large Silver Blossom Bamboo Earrings. lovely to catch up with your blog after being out of town! love the honeycomb earrings. great giveaway. the Large Cloud Bamboo Pendant Necklace is amazing!! I love her bamboo gem drop earrings! I'm also a fan of your FB! I love the cloud bamboo necklace! it's so cool and new! And I was a math major so this necklace rocks my socks! I hope I win! I like the Bamboo Gem Drop Earrings. Signed up for The Harbinger Co. mailing list. The Orhid Necklace is absolutely stunning. Thanks they are all amazing! I love the bamboo honeycomb necklace, it's so complicated and delicate. hands down those blossom bamboo earrings! Cool shop! I love the bamboo gem drop earrings. Everything in her shop is amazing! fb fan to the harbinger co. I like the bamboo petal earring studs . now an fb fan of harbinger co.
i am already a fb fan of kate and oli . 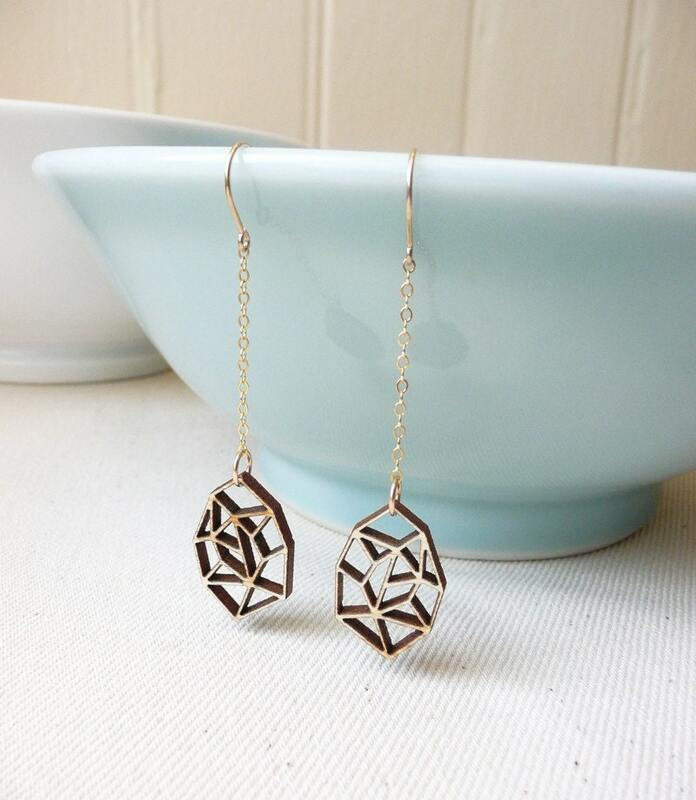 Love the bamboo Gem drop Earrings! Like Harbinger Co on Facebook! Like Kate & Oli on Facebook! 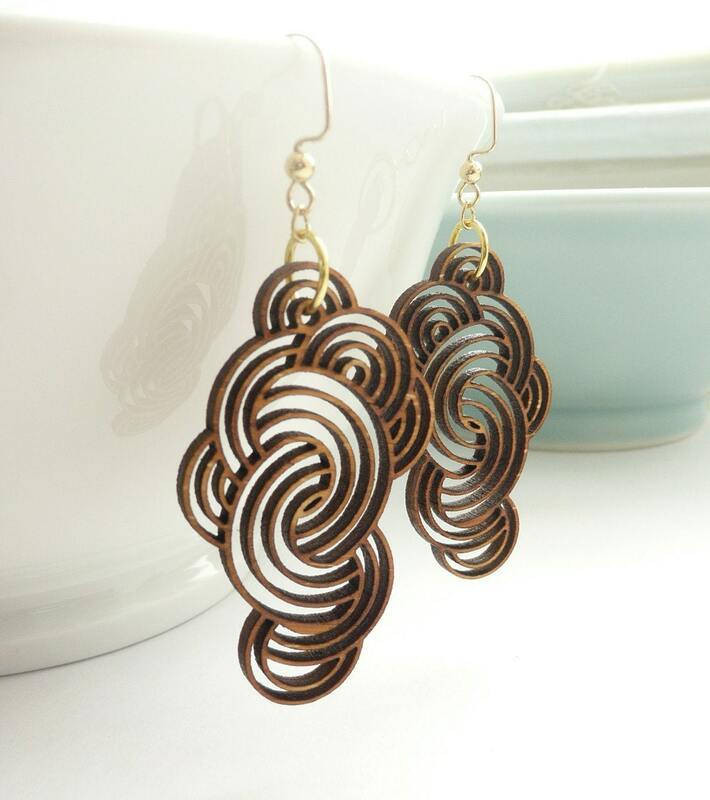 The Bamboocomb Earrings are my favorite! This is a hard decision! I think my favorite is the Single Cube Drop Necklace. I love the bamboo Gem drop Earrings! The single cube drop necklace is def my favorite!! Im also liking you on FB!!!! I like Bamboo Honeycomb Stringbean Pendant Necklace. My favorite item is the Single Cube Drop Necklace. Bamboo Honeycomb Stringbean Pendent and Earrings. I love the large bamboo cloud earrings. facebook fan of Kate annd Oli. I love all the items but my fave is the Large Yellow Blossom Bamboo Earrings. Love the design & color! 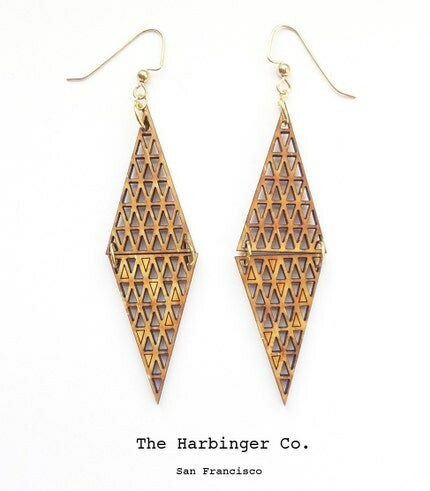 My favorite item from Harbinger Co. is the "Bamboo Gem Drop Earrings". On the Kate and Oli Mailing List. Wow such lovely things! 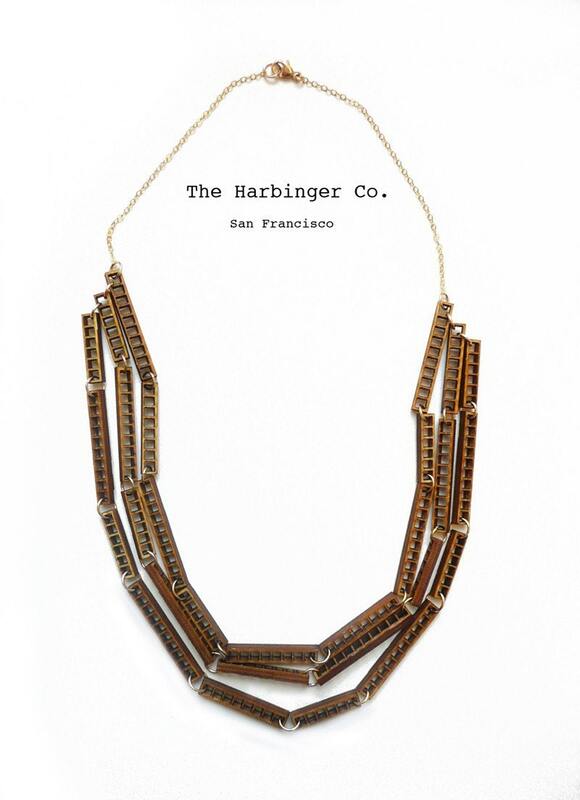 I think my fav is the Bamboo Honeycomb Stringbean Pendant Necklace - but all are so pretty! My favorite is the grape studs earrings. I`m a follower thru google friend connect. I think the bamboocomb earrings are amazing!!! I love the bamboo cloud earrings! I love the Bamboo Cloud Earrings! But everything is so pretty and original, thanks for the giveaway! I follow with google. i am in love with the harbinger co.! amazing giveaway! i've been obsessed with the "Large Yellow Blossom Bamboo Earrings" ever since i laid my eyes on them! i became a fan of harbinger on facebook! crossing my fingers! :) thanks for the amazing giveaway! 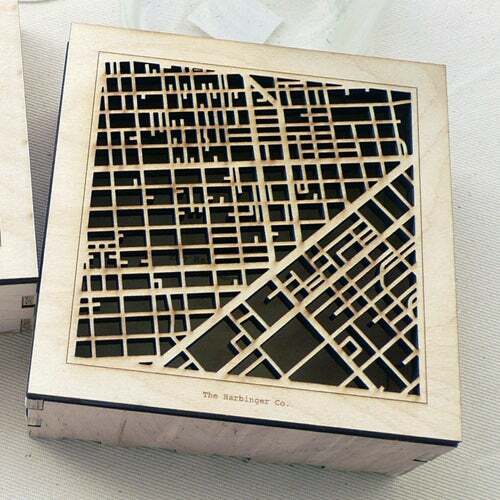 I really like the circle map box, it's such an interesting design! I love the Single Cube Drop Necklace. Large Silver Blossom Bamboo Earrings. 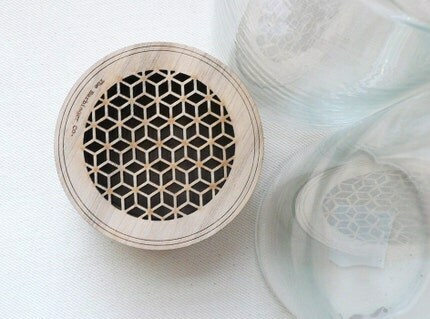 I collect boxes so when I saw the Square Honeycomb Wood Box it was love at first sight! I like the Clouds Circle Wood Box. Christina - xristya@rock.com - I love the Bamboo Honeycomb Lace Necklace! I couldn't go past the medium bamboo honeycomb pendant. Lovely! I love them all! I think the small bamboo honey comb is my favorite. I love the Medium Bamboo Cloud Pendant with Chain! Signed up for The Harbinger Co. I also became a fan of The Harbinger Co. on Facebook. I like the simplicity of the Bamboo Gem Drop Earrings. 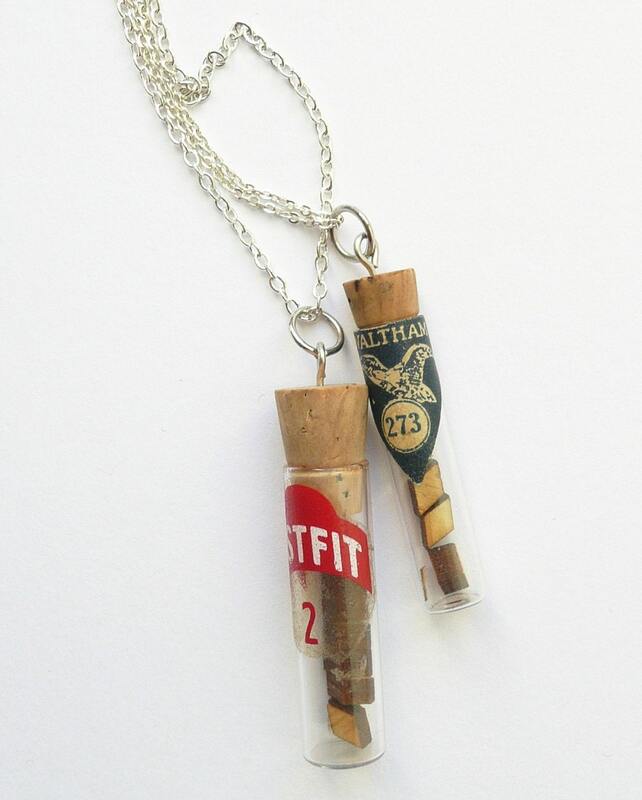 The Antique glass flask necklace is my favourite. I'm a facebook fan of Harbinger Co. I signed up for the harbinger co. mailing list! 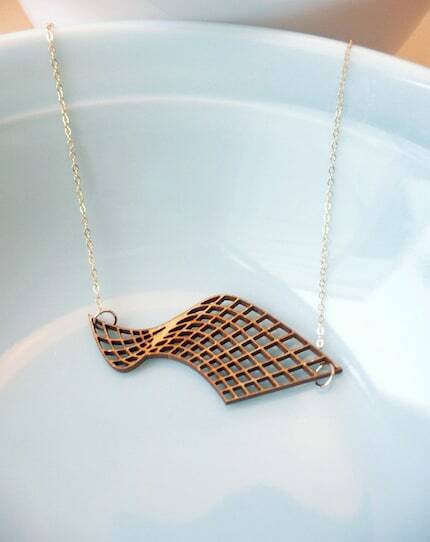 I follow your blog in Google Reader, and the honeycomb necklace is my favorite! Thanks for showcasing such a innovative store! Old follower. Loving the Large Gold Bamboo Blossom Pendant with Chain. It is awesome! I love the Bamboo Honeycomb Lace Necklace! Beautiful work! I become a Facebook fan of The Harbinger Co. I become a Facebook fan of Kate and Oli. 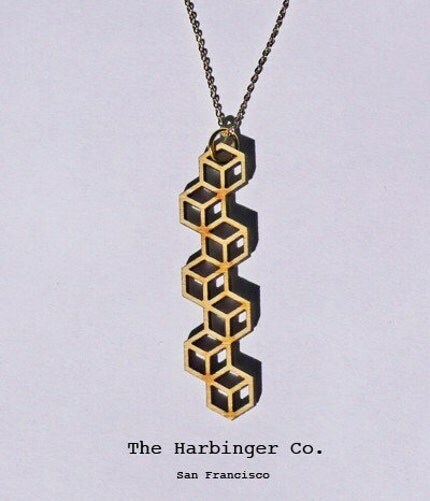 I blog about this giveaway here http://giveawaytime.blogspot.com/2010/06/three-cubes-necklace-from-harbinger-co.html. And I'm a facebook fan of kate and oli! 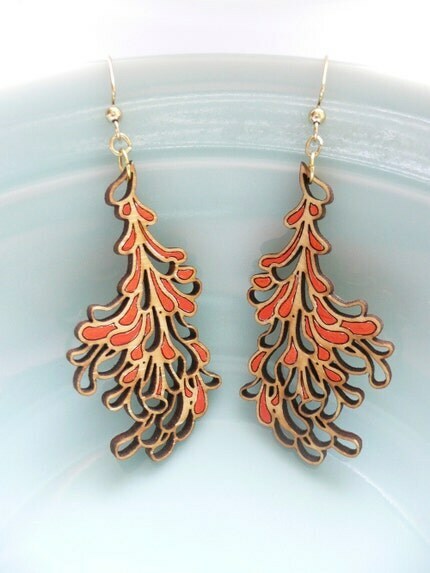 I love the Medium Red Blossom Earrings. So unique! I love the large white blossom bamboo earrings! I'm a Facebook fan of The Harbinger Co.